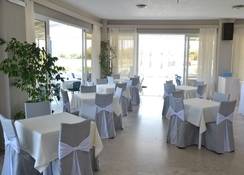 Small, family-run and popular with return guests. Location: In a quiet location. To gently sloping sandy-pebble beach is about 60 m, according to Kos town about 5 km. Outside the hotel there is a bus stop. Numerous shops are 500 m, several restaurants and bars within 1.5 km. 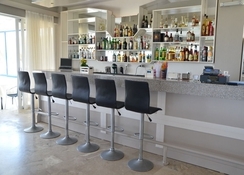 Facilities: Renovated in 2010, hotel has 43 rooms spread over 2 floors, reception with hire safe, satellite TV lounge, Wi-Fi in the lobby (inclusive), Restaurant (Greek tavern). In the gardens there is one swimming pool with sun terrace. 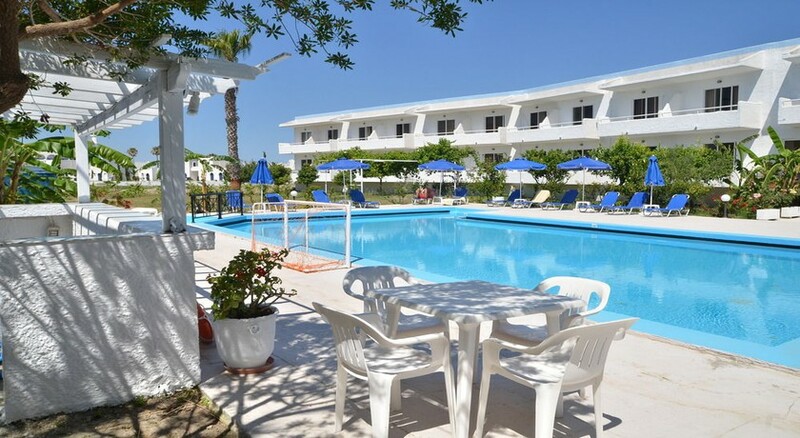 Sun beds and umbrellas at the pool and beach including accommodation: double room (A2-3A) with fridge (extra charge), air conditioning (extra charge), telephone (extra charge), shower, WC, hairdryer and balcony. 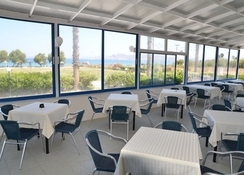 Available as single rooms (A1A), with sea view (A2-3B) or as a low-cost rooms (A2S), each with the same features as A2A booking. Dining: breakfast. Expanded continental breakfast buffet.